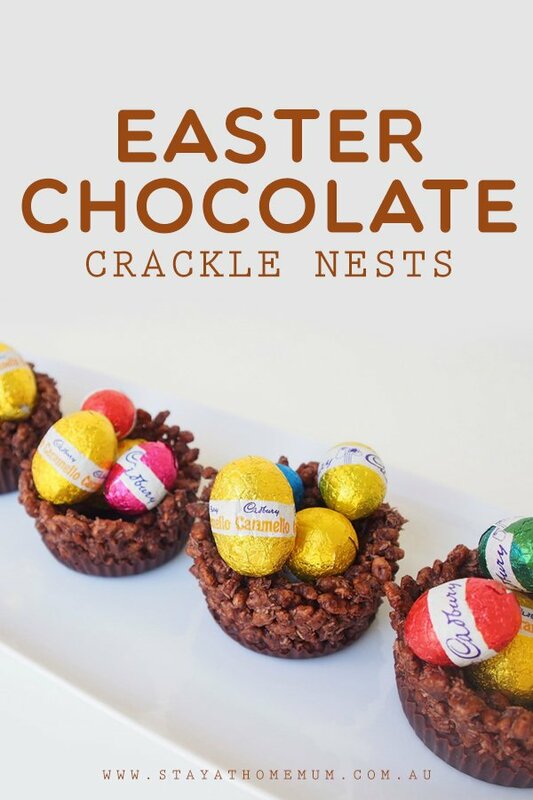 Easter Chocolate Crackle NestsThe best thing you'll eat this Easter! Easter Chocolate Crackle Nests are super fun to make and incredibly creative. The kids love making them! They also taste so good! Easter Chocolate Crackle Nests are super fun to make and incredibly creative. The kids love making them! They also taste so good! Mix all ingredients together & spoon into patty pans (or use un-greased silicone muffin cups for easier removal). Using the back of a spoon press the mixture down in the middle and up along the sides, forming a nest. Using a knife, loosen the edges and gently pop out the nests. Easter. To decorate: sprinkle with coconut and fill with mini eggs. Easter Chocolate Crackle Nests are suitable to freeze for up two months. Store covered at room temperature for up to two days. Nests can be frozen un-decorated. For a super cute alternative you could form these in mini muffin cups. If you would like to tint the coconut a certain colour simply place it in a resealable plastic bag along with a few drops of food colouring. Massage and shake until evening distributed. You could use jelly beans or chocolate covered almonds for a different variety of eggs.